It’s estimated that over 15% of Americans suffer from TMJ disorders. It’s difficult to determine the precise number of people affected, because the causes and symptoms of TMJ/TMD can vary, and currently there is no standard diagnostic test. However, TMJ dysfunction can cause a lot of chronic pain and can negatively affect your quality of life – and you might not even know the source of your pain is actually your jaw! The good news is, we can help. Schedule a consultation with a Dr. LaBry today! 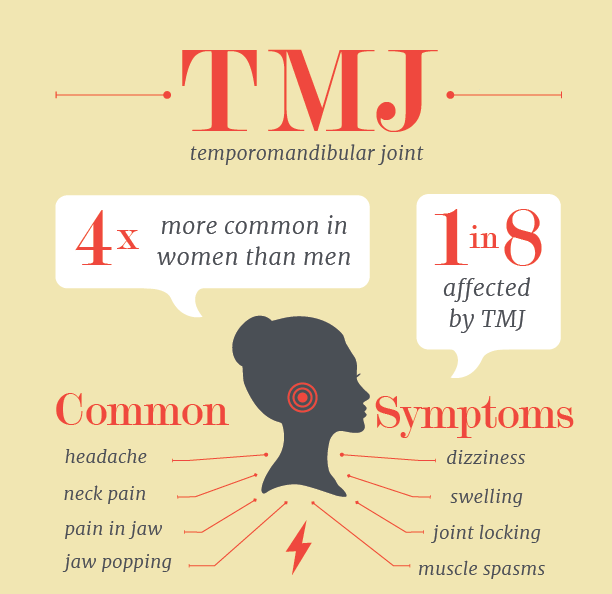 TMJ and TMD are abbreviations sometimes used interchangeably for Temporomandibular Joint Disorder. This hinge connects the upper and lower jaw, and chronic pain is felt when they aren’t working properly. What keeps them from working properly? Sufferers may find themselves taking anti-inflammatory medications regularly, unsure of how else to treat the pain. Most people are surprised to learn their dentist could provide a solution that prevents the pain with a non-invasive solution. Age – Women in their childbearing years are the primary reporters of this painful disorder. Hormones – Women taking birth control are more likely report TMJ symptoms. Joint structure – Men and women have differences in their facial structures. Stress – You might not even realize you’re clenching your jaw or grinding your teeth when you’re stressed, and tasks like lifting heavy objects can aggravate your jaw joints even more. If you were nodding your head while reading about TMJ symptoms, Dr. LaBry may be able to help relieve your pain. The solution could be as simple as wearing a custom oral appliance or mouth guard while you sleep. Wearing an oral appliance at night protects your teeth from the harsh grinding and clenching that keeps your TMJ from relaxing and healing. A relaxed TMJ makes for a happy TMJ, eliminating your need to treat symptoms! This non-invasive alternative is a wonderful option for patients that would like to avoid prescription medications and invasive surgeries at a later date. Dr. LaBry can provide you with a mouthguard that is custom made for your comfort and convenience. Can you imagine a life free from chronic myofascial pain? LaBry Family Dentistry would like to make this a reality for you. Why wait any longer for pain relief? Give us a call today to discuss TMJ treatment! We want to answer your questions and provide you with long-term pain relief and oral health care. Give us a call today to schedule a consultation with your Broussard dentist, Dr. LaBry.